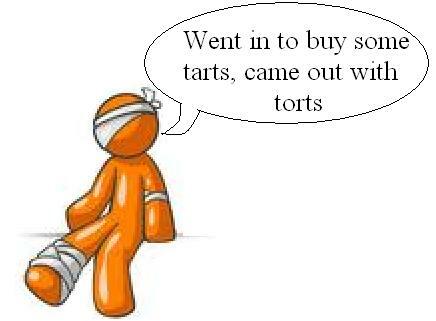 Tort is basically a word for “wrong” in French. It is a wrong involving a breach of a civil duty towards the public. The 2 elements of a tort are (i) the act, i.e. the physical element which usually compromises of Defamation, Injury Nuisance, Fraud, Trespassing, Misuse of Personal Information, etc and (ii) The mind, i.e. the mental element which is generally an ill intention or negligence. Retort: In litigation, it is always necessary to put yourself in the shoes of the defending counsel. In a case of torts the defendant’s pleas usually involve inter alia contributory negligence, consent, plaintiff’s default, necessity & private defense, inevitable accident (Act of God), authorization & limitation. Therefore, one must anticipate all these pleas and be prepared with arguments that eliminate all the above pleas. (a)Aggravated and exemplary damages: Generally granted when the tort is outrageous in nature. Sometimes the judges sympathize with the defendant but since he is at fault and if the damage done is small only nominal damages need to be given. The reason for this is that the Court does not want to legalize the defendant’s actions by letting him go scot-free. This way, the court has favoured the aggrieved, but has also shown it’s own intentions. This approach has been approved by the Supreme Court of India as well. (b) Parasitic de-impairment: Here, damages are not granted only for losses occurred directly by the tort. For example, if a woman burns her face while working in a plant, she can along with other damages also claim additional damages claiming that because of her current condition her relation with her husband has been forever effected. (d) Contemptuous & nominal damages: The court sometimes grants the aggrieved ‘the smallest coin of the realm’ i.e. a purely nominal sum such as Rs. 1. · Enforcement of bank guarantees.